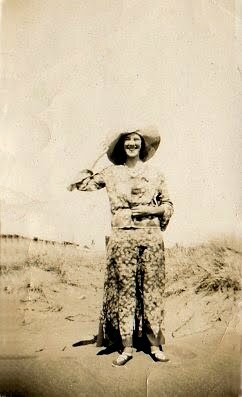 >A very good friend emailed me shortly after my last post on the lady with beach pajamas sharing with me a fabulous picture of her grandmother in New Zealand. She says the photo is from around 1931 or 1932. >Lauren, I found a beach pajama repro pattern, but it only comes in 40in bust http://www.pastpatterns.com/114.html. Have you thought about reproducing your pajama pattern? It's just too cute for words! >Thanks, gals! I really adore her stylish pajamas! Yum!Andrea, I was actually thinking about it… it does take up quite a bit of paper, but they are REALLY fun and I love the way they make up. Maybe in time for Summer! Do you think there would be a demand for them? >That is a great picture! I love her outfit. >Terrific. I think there's a demand, at least at this house! I would also like to see some separate b.p. pants, as in the French pyjama blog: http://lamodepyjama.blogspot.com. I did by that Past Pattern one, since it is my size, several months ago, but don't know anyone who could make them up, so it's unopened in a drawer. >Lauren, beach pajama patterns tend to go high on eBay so there must be a market for them. If you do reproduce your pattern, make sure to display a picture of you in yours. I have found that what scares newer sewists from vintage patterns are the line drawings if they are only used to photos on modern patterns. >Ok, they're added to the repro list then!I'm hoping to remedy that very issue soon- I'm taking part in a fashion show in May and am in the process of making up all of the patterns :DExciting! >Gorgeous! Particularly exciting for me because I'm down here in NZ (and have spent time on the dunes at Otaki! )There are a lot of early images out there of Kiwi's on the beach. Check out Leslie Adkin's stuff:http://collections.tepapa.govt.nz/search.aspx?term=adkin&imagesonly=onThey didn't seem to have quite the hold up that American's did about photographing themselves in casual wear.